The overall global temperature change sequence of events appears to be from 1) the ocean surface to 2) the land surface to 3) the lower troposphere. 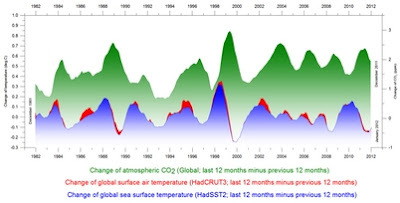 ► Changes in global atmospheric CO2 are lagging about 11–12 months behind changes in global sea surface temperature. ► Changes in global atmospheric CO2 are lagging 9.5-10 months behind changes in global air surface temperature. ► Changes in global atmospheric CO2 are lagging about 9 months behind changes in global lower troposphere temperature. ► Changes in ocean temperatures appear to explain a substantial part of the observed changes in atmospheric CO2 since January 1980. ► CO2 released from use of fossil fuels have little influence on the observed changes in the amount of atmospheric CO2, and changes in atmospheric CO2 are not tracking changes in human emissions.